Fox NewsPresident Donald Trump appears on ‘Fox & Friends’ with host Ainsley Earhardt. Ainsley Earhardt, one of the hosts of President Donald Trump’s favourite morning news show, “Fox and Friends,” defended Trump’s labelling of the press as the “enemy of the American people” on Thursday morning. “He’s saying if you don’t want to be called the enemy, then get the story right, be accurate and report the story the way I want it reported,” Earhardt said. This comes just days after a Trump supporter and would-be terrorist mailed bombs to CNN, perhaps Trump’s least favourite network. Ainsley Earhardt, one of the hosts of President Donald Trump’s favourite morning news show, “Fox and Friends,” defended Trump’s labelling of the press as the “enemy of the American people” on Thursday morning, and even argued that the media should report the news the way the president wants it reported. After showing a clip of the president insisting in an interview with Axios that he must “fight back” against reporting he deems wrong or unfair, Earhardt launched into a broad defence of the president’s aggressive attacks on the media just days after a Trump supporter and would-be terrorist mailed bombs to CNN, perhaps Trump’s least favourite network. Earhardt sympathized with the president, who she has long argued is covered unfairly by the majority of the news media – or at least TV news. “How frustrating would it be if you are the president of the United States and every single time you turn on the TV on most of the channels they are misconstruing what you say?” she said. 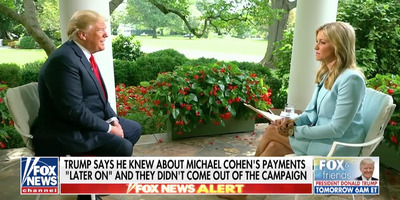 Earhardt then attempted to explain why the president constantly derides the media – something he says his fans love and helped pave his way to the White House – and said the president just wants the news reported from his perspective. “He’s saying if you don’t want to be called the enemy, then get the story right, be accurate and report the story the way I want it reported,” she said.